And I don’t just say that to reel you in. 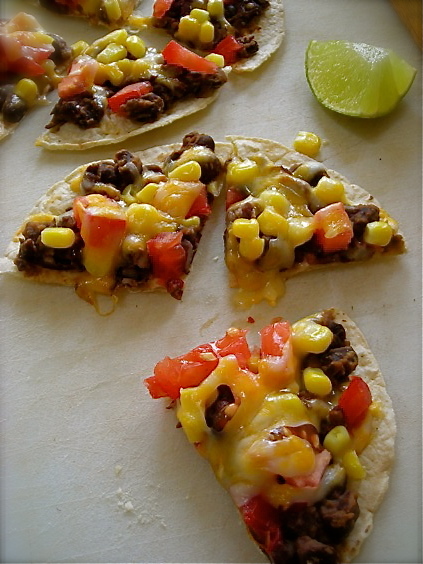 If you enjoy a good creamy and altogether crazy delicious flavorful spread for that corn chip addiction in your life, then look no further than this recipe. Because once you lifted that first chip to your mouth, dripping with this vegetable laden, kicky dip, my friends, you will never again look at bean dip the same way. And what better option to have on hand for the any upcoming major sporting events, you know, like Football or something? As I was making this, and then after that first heady bite, where I swooned and ‘Oooh’d and ‘Aaaah’d myself into a tizzy, I had this thought that it was too bad we weren’t football folks, because this dip would be a welcomed addition to any snack table, kept warm in a crock-pot, ready for copious scooping. So if you like throwing a big gathering to cheer on your favorite team, you can’t really go wrong with this. 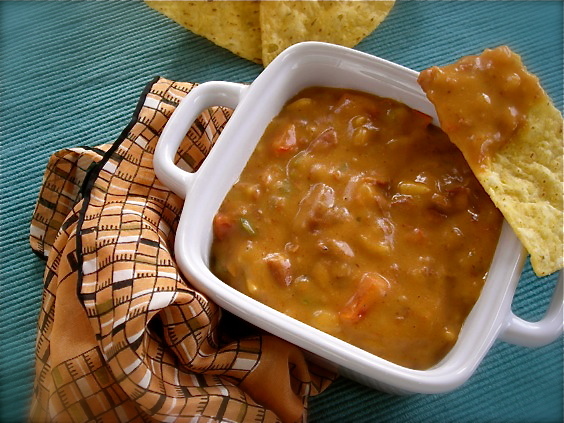 The key for the extreme delicious flavor is two things: one, you use Chili flavored beans to make it, and two, you stir creamy mexican style cheese dip into the final product, creating a 1-2 punch of taste, worthy of swooning and lots of compliments. Not to mention corn chips. Although any gooey cheese dip will work, I can’t recommend enough making a cheese dip from scratch, and not only from scratch, but from the authority of all things Texan in style, please do yourself the Rio Grande favor of making Lisa’s Chile Con Queso as it too will knock your socks off. With that recipe bubbling on the stove, you make this fantastic bean dip, whisk some of the Queso into it and you’ll have not one, but TWO awesome options for the next party that graces your house. Or just a delicious snack to chase away a chilly winter evening. Approximately 2 cups Chile Con Queso cheese sauce, either scratch made or commercial. In a deep skillet, saute chopped onion and peppers until very soft and beginning to turn brown in spots, about 10-15 minutes, stirring occasionally. Add the beans with their liquid, scraping the cans with a rubber spatula, and stir them into the vegetables. Heat for about 5 minutes. Using a heavy spoon or potato masher, mash the mixture until most of the beans are broken up and smooth. Leave some pieces whole for good texture. Stir in the corn, tomato, chipotle and cumin. Heat until bubbling. When bean mixture is hot all the way through, add in about 1 cup of the cheese sauce. 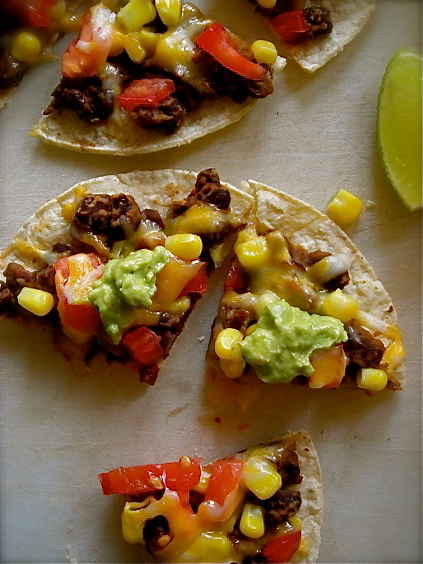 Stir quickly to incorporate the cheese into the bean dip, making sure no lumps are left behind. Add the remaining cup and stir to mix this in as well. Heat through and taste to adjust seasonings. Make it spicier if you like it that way. 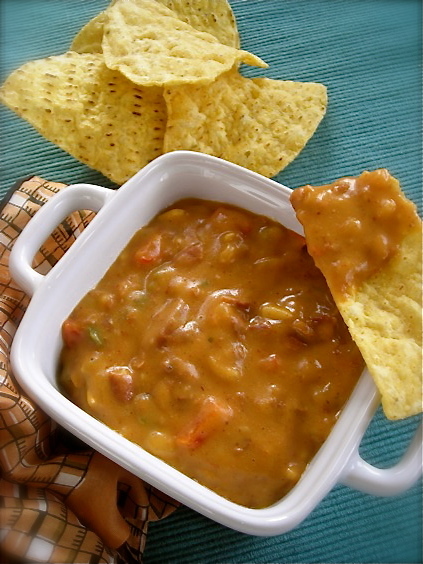 The dip can be kept warm in a crock pot, or on the stove. Stir occasionally to keep blended. This reheats beautifully. Thanksgiving is just a few days away. Like you need to be reminded of that? We’ll be experiencing a pre-Thanksgiving snowstorm this year but I’m thinking it won’t hamper any of our plans. My family is all local, and hardy winter souls with dependable cars and a lifetime of snow experience. Plus it’s a homemade meal. They don’t miss that for anything. My menu is planned and it’s always pretty simple. The family is not much for experimenting with rambunctious flair; they like their mashed potatoes, a good smoked turkey on the grill and plenty of gravy. We’ll drink wine, snack on cheese and crackers and enjoy each other’s company and really, that’s all that matters at all on a holiday, isn’t it? Snacks are an important part of any gathering, and since I’m doing the cooking, someone else is bringing the pre-meal offerings. But if it’s me making something for nibbling, I like a bit of variety and spice. 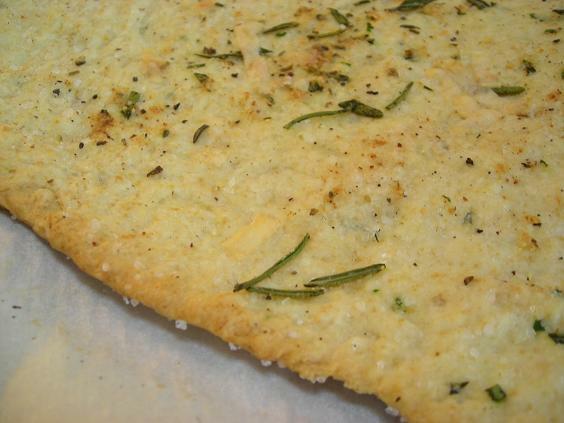 For something delicate and different, this Herb Flatbread from a long ago Gourmet magazine is a simple and delicious option. It’s good enough to eat alone, or topped with a thin slice of sharp cheese. It’s a bit too delicate to spread much on, but nice to have in a cracker basket. 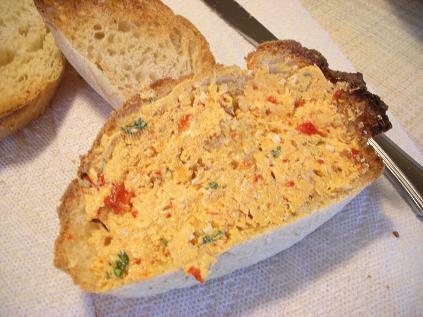 For something really different to spread on your dinner rolls, or a good hearty cracker, this Roasted Red Pepper butter is an awesome option. It’s rich, with the sharp tang of roasted peppers, and could even turn a pan of mashed potatoes into a unique delight. And if you want to really stretch your wings and offer something bold, spicy and off the beaten track, this fragrant nut and spice mix called Dukka is a wonderful option for an appetizer. 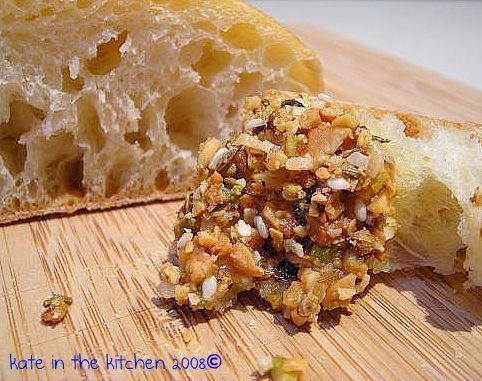 A fragrant crush of nuts, cumin and coriander seeds and a little coconut, it makes for a good crunchy texture against soft bread that’s been dipped in olive oil. The most important aspect of any holiday gathering, though, is to relax, enjoy the day and the company and don’t sweat out every detail. Here’s hoping your Thanksgiving is full of warm smiles, plenty of laughter and lots of delicious food. In a 350 degree oven, roast the nuts until golden brown and fragrant, stirring occasionally, about 10-15 minutes. Empty into bowl to cool slightly. In a skillet over medium heat, toast coriander seeds until fragrant and browned, about 6-8 minutes. Remove from pan to bowl for cooling. Toast cumin and coconut until coconut is golden, 4-8 minutes. Cool with coriander. Toast sesame seeds until golden, 4-6 minutes. Cool separately. In work bowl of food processor, combine nuts, coriander, cumin and coconut; pulse until coarsely chopped, or preferred consistency. Empty into large bowl and add sesame seeds, stirring to combine. Season with a little kosher salt and black pepper if desired. Keep in airtight container, either refrigerated or frozen. Combine all ingredients in a small bowl and beat with a hand mixer until smooth and fluffy. Can be shaped into a log and chilled, or stored in a plastic container. Hint: with the peppers, the finer you mince, the prettier and more spreadable the butter will be. I used a knife on mine but next time will use a food processor or chopper to get them even finer. Heat oven to 450 with a pizza stone on middle rack. Combine dry ingredients and herbs. Make well in center and pour in oil and water. Stir with spoon until a soft dough forms. Turn out onto parchment paper and knead about 5-6 times to bring dough together. Can be divided into 2-3 small balls and rolled flat, or rolled out as one large circle. Drizzle olive oil over top, sprinkle with sea salt and more herb and transfer, parchment and all to heated stone. Bake until browned in spots and fragrant- time will depend on how thin dough is rolled. Remove from oven and cool (don’t cool on stone- it will continue to bake). Slice with pizza cutter and enjoy.